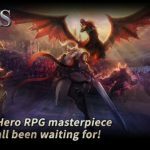 We had previously covered Age of Heroes: Conquest, which is a new tactical turn-based RPG from 5th Planet Games. As we had explained in our beginner’s guide to the game, the game allows you to build a team of heroes, equip those heroes, and gather loot. You can fight monsters, including boss characters, go on raids, and experience a number of multiplayer/MMO/MOBA features, including the PvP arena, and Guild Wars and Raids. 5th Planet claims the game has “endless replayability,” and with a combination of features that appeal to the solo gamer and those who enjoy the massively multiplayer aspect of MMORPGs, this game has something for everyone as far as RPGs go. Our last strategy guide was all about the basics of the game. 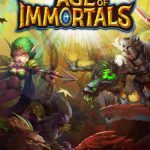 But if you’ve learned those basics and want to move forward faster now that you’re an intermediate or advanced player, we suggest you to check out this new Age of Heroes: Conquest strategy guide. 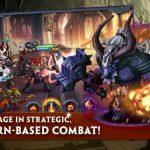 This mobile game may be similar to a lot of other RPGs on both the App Store and Play Store, but since all these games have their own twists along the way, you can read on if you want to get further in the game and do so successfully. 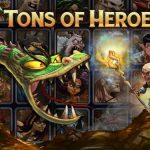 Although this game can be played without the help of any other “real” players, it’s still very much advisable if you enjoy the advantages social gaming has to offer in Age of Heroes: Conquest. You can do this by joining a guild the moment you have the chance, as this could give you some valuable rewards you wouldn’t normally get if you were playing solo. Being part of a guild allows you to access the Training Grounds, and in there, you can purchase several items required for the hero training process. You can also buy hero shards with your gold at the Trading Post, though there’s no guarantee you’ll get rare ones. Those are just a couple of the primary advantages of being part of a guild, so join one if you’ve got the chance, or make your own and meet new friends! Vulgore is one of the first heroes you’ll have access to in this game, and he’s more of a classic tank character. This fire warrior, true to his tank status, isn’t great on the offensive end, and can be considered above-average at best in that regard. But he packs a lot of health points and is good on defense, with a normal skill of Defend that lets him shield any ally on your team and soak up the damage. Again, any offense you get from tanks is icing on the cake, so focus on Vulgore’s health and defense, and make sure he’s included in your party during the early stages of the game. You need someone like him to protect heroes like Arlok and Shaide, especially since the game’s enemies tend to gang up on one hero until they’re all out of HP. Likewise, you’ll also want to focus on one enemy alone when attacking the enemy party. As dying enemies are still capable of doing damage, you want to take them out one by one, instead of distributing the damage across several enemies. It’s also important that you focus on those who are capable of doing the most damage, though on your end, you should follow the first tip and use those tanks to protect your low-health, low-defense heroes. The game’s AI is smart enough to recognize heroes that are comparatively pathetic in those areas, so make it a case of “two can play that game” by focusing on those low-health, low-defense enemies, and/or those that are good on the offensive end of things. This is something we often advise gamers in RPGs, and we had actually touched on this in our list of beginner tips. But just as a reminder, you should keep the elements in mind, and balance things out by having heroes that are strong against different types of elements. In addition to this, you should use this tip in conjunction with the last one; in RPG parlance, it’s called “focus firing,” and enemies are also smart enough to recognize elemental strengths and weaknesses when zeroing in on one character in specific. You should also have that elemental balance in place because there are some mages on the enemy side who may not look like much, but have spells whose area of effect could impact everyone on your team. You don’t want your entire party to be wasted by one simple spell. Rubies are Age of Heroes: Conquest’s premium currency, and the game offers you different ways in which you could get them. First, you should go for as many stars as possible when playing the campaign levels, as that opens the Star Chest, which may have rubies inside. Second, complete as many quests, achievements, and daily tasks for a better chance of getting rubies as a reward. Lastly, play in the battle arena, as the higher you rank on the PvP Gauntlet, the more rubies you’ll receive. Now that you know how to get more rubies, here’s how you can spend them. In fact, there’s only one primary thing you should be spending your rubies on, and that’s the deluxe summon. You’ll have to pay 200 rubies each time you perform a deluxe summon, but you should also make a pull with the right expectations in mind. Sometimes you may get a hero, but there may be situations where you won’t get a hero, but rather the “consolation prize” of hero shards. Still, using a deluxe summon is a great way to add to your party, and in case you need reminding after two “balanced party” tips in two guides, you want all elements to be represented on your party when possible.